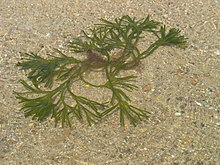 Bryopsidophyceae is a class of chlorophyte green algae. ^ a b Guiry, M.D. & Guiry, G.M. (2007). "Class: Bryopsidophyceae taxonomy browser". AlgaeBase version 4.2 World-wide electronic publication, National University of Ireland, Galway. Retrieved 2007-09-23. This page was last edited on 6 March 2018, at 05:12 (UTC).